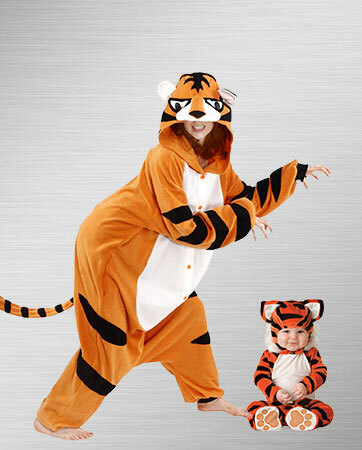 Prepare to get wild with some big cats this Halloween! 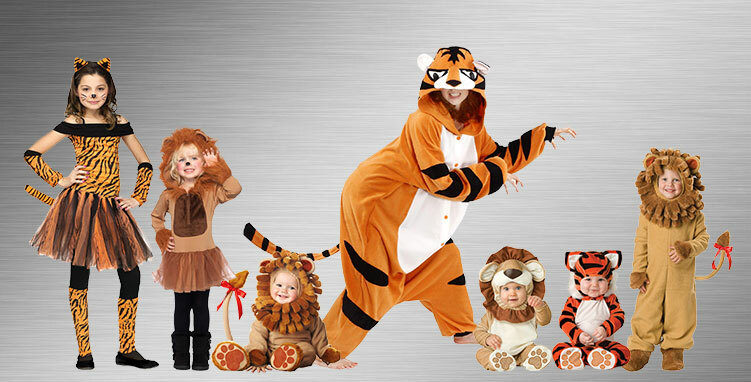 If you're headed to a costume party or want to take the cubs trick-or-treating, there are lots of outfits and styles for you to choose from when you shop for Lions and Tigers Costumes! There are lots of great looks for kids and adults, so find the perfect style now! 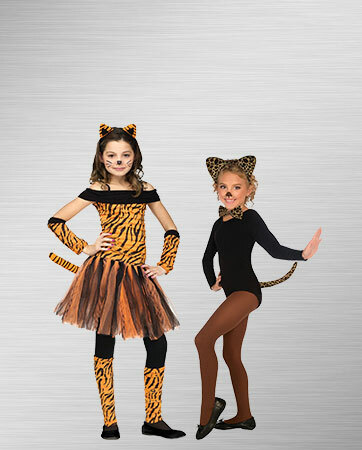 Get ready to walk on the wild side when you step into the role of a ferocious cat for your next costume extravaganza! A fierce animal lurks inside each one of your family and friends, and these costumes will help bring out their fun side. Choose from furry costumes to keep you warm when the wind blows and costumes that showcase the adorable features of a cozy cat. 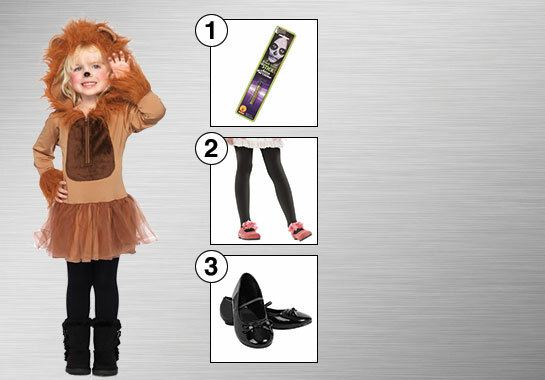 You can be untamed, cute, cuddly or all three when you don any of these fuzzy feline costumes. Dress the whole family up and hit the town for some trick-or-treating, or jump to the winner’s circle at your next costume contest. These classic costumes are sure to be a hit. So get out your claws, show your fangs and release your inner cat! This is the sweetest lion you will ever find in the savannah! He’s got all the courage he needs to run and jump through the tall grasses, as he plays and laughs with the other lion cubs. Soft, curious and playful now, he’s got big dreams of becoming a mighty king someday soon. He has a lot to learn, though, as his days consist of frolicking through the jungle and stopping only to take a cat nap in the tall grasslands! This lioness is every lion’s best friend! She’s sweet, cuddly and always ready for a good time. Her fur keeps her comfortable for hours of running through the jungle or even a long day of parties and trick-or-treating. She’ll stand out among her friends as a fearless leader. She may be the queen of the jungle, but she’ll be tired after such a long day of fun. This purrrfect lioness will rest knowing her true jungle colors. This little tiger is only slightly ferocious, but in the most adorable way! He’ll become everyone’s favorite tiger the moment he steps into the room. With his fuzzy belly and soft fur, you won’t have to worry about getting close to this cuddly cat. No fangs or claws are in sight, as this is one tame tiger. But don’t worry, pretty soon he’ll be learning to roar! He’s on his way to reaching his wild and ferocious potential! Tigers are a renowned member of the animal kingdom, and this tigress is no exception. Showing her truly fabulous stripes, this tigress knows she’s the new queen in town. Strutting her stuff in bright orange and black, it’s tough to ignore such a vibrant sight. She’ll step onto the scene with some ferocious attitude, bringing life to any party or costume gathering. This tigress is ready to have a roaring good time as the most fashionable tiger in the group. With great costume options for moms, dads, kids, babies and even dogs, this party will look and sound like a zoo — all without smelling like one! You might even fool someone into thinking it’s the real deal. Start practicing your animal sounds right away and make sure they are perfect before the party begins! So, what are you waiting for? It’s time to choose which animal you will be! Get ready to be the coziest pair at the party! A tiger and a frog may make an unlikely duo, but that just means you’ll capture everyone’s attention the minute you walk through the door. The tiger will pounce as the frog leaps on by. Let these warm and fuzzy costumes keep you comfortable all night long. You’ll have everything you need for a simple and successful costume. 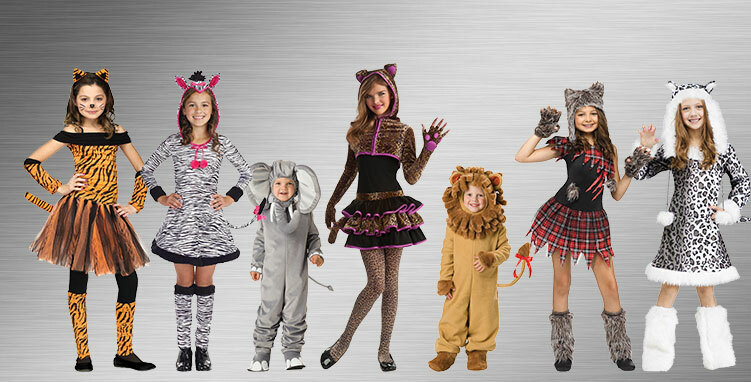 Make your little girls’ dreams come true when you dress them up as their favorite ferocious felines. A leopard and a tigress will become the best of friends as they come up with creative costume ideas together! Whether you’ve been planning for months or you simply need an easy, last-minute costume fix, these girls’ costumes offer the perfect solution. Spots and strips are always in style! Mom tiger and baby tiger can be cozy together in their bright orange fur and stripes. 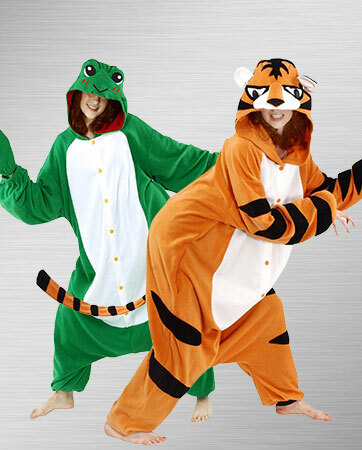 Perhaps the tiger is your favorite animal, or maybe you are just looking for a way to stay warm; either way, these cuddly costumes will deliver and you’ll both be wrapped up in the warmth of a tiger’s embrace. Forget about the lions and the bears and show your little tiger the true meaning of being a jungle cat! Your little ones will surely be destined for greatness when they dress up as beautiful baby beasts. 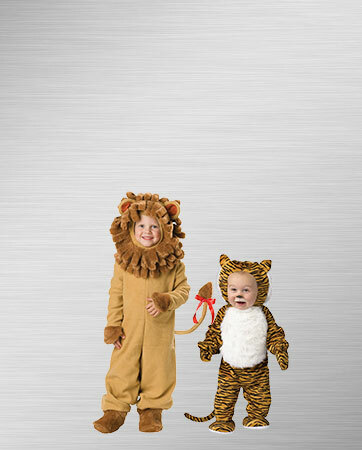 This little lion and tiger crew may not look ferocious, but don’t underestimate the power of their cuteness! These costumes work for everyday dress-up, of course, but they are also guaranteed to be the Halloween costumes of your child’s dreams! Adorable, warm and cozy, these two cat costumes satisfy all of your strictest criteria. Be careful not to blink, because pretty soon these babies will grow up to be jungle royalty! Makeup Stick: She’s not a lioness without her nose and whiskers! Make sure you have everything you need to create a flawless feline face. Black Tights: Complete the seamless look and keep her legs warm and covered with opaque black tights. Black Child Shoes: Comfortable shoes are a must for any important lioness. Tiny black ballet flats will keep her happy and frolicking among the tall grasses of the jungle.